ADRIEN BRONER: "EXPECT FIREWORKS...THIS FIGHT CAN END AT ANY TIME"
"Every time I fight, I put on a problem, man. You can always expect fireworks and that's what I'ma bring. It's not even the Fourth of July yet, man. I'ma seasonal Fourth of July. Every day is Independence Day for me in the gym. I'ma always be bringing the fireworks, so when you see me, man, just don't be too close, man. I might blind you...November 26, man. It's a new era. 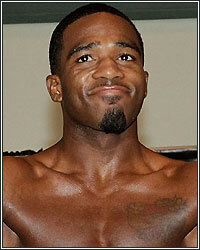 Tune in to watch Adrien Broner, the new face of boxing. Before you get to the fight, get your popcorn, your chips, your drinks, and be ready because this fight can end at any time," stated undefeated super featherweight Adrien Broner, who talked about his upcoming hometown clash with Vicente Martin Rodriguez this Saturday for the vacant WBO title. Check out what else he had to say! JR: What's up, man? It' s nearing fight night. Tell me how you feel, Champ? AB: I feel good, you know? I'm ready to go in there and shine. JR: Are there any guys that you've been sparring with who have been giving you good work, or have you been putting on clinics in training? AB: You know I'ma always put on a clinic. I'm not just a boxer; I'm a technician, man. I can direct, redirect, so, you know, I'm a surgeon, man. JR: Last time on HBO, we saw you knock out Jason Litzau in the first round. What can we expect this time out? AB: Every time I fight, I put on a problem, man. You can always expect fireworks and that's what I'ma bring. It's not even the Fourth of July yet, man. I'ma seasonal Fourth of July. Every day is Independence Day for me in the gym. I'ma always be bringing the fireworks, so when you see me, man, just don't be too close, man. I might blind you. JR: You're also fighting in your hometown. What are you expecting out of the fans in the Queen City? AB: They're gonna be very electrifying. Emotions are gonna be high and everyone is gonna be ready, man. They are gonna be ready for a fight, man. It's gonna be a good crowd that has a lot of energy. Every time I fight, they show love and this time, they gonna be ready for me to put on another great performance. JR: Are you familiar with your opponent? AB: I know about him, but it's my time now though, man. I just feel he is in the way. Anybody that I face is in the way, so we either pick him up, move him, or make him move. At the end of the day, it is what it is. JR: He seems to have a lot of experience. Do you think that's gonna matter come fight night? AB: Everybody tends to lean on experience, but I also have craft and talent, along with what I faced before. I also have experience. I'm not just some young buck coming in wild. I have a lot of experience. You know, I have been doing this since I was six years old. I can adjust to any style that's put in front of me, so that experience that he got can only go so far for him. I know I got the talent, so that experience, that don't mean nothing. JR: I honestly don't think you got the credit you deserved for beating Litzau in just one round. What do you think you can do this time in order to get full credit? AB: You know, man, guys like me and Floyd Mayweather never get the credit that is deserved. It don't matter if I knock out a guy in 30 seconds, they will never give me the full credit, you know? At the end of the day, when I go in the ring, I just do me. I don't worry about what the critics say. JR: That's the perfect way to go about things, man. Anything else you want to mention before you head out? AB: Definitely, man. November 26, man. It's a new era. Tune in to watch Adrien Broner, the new face of boxing. Before you get to the fight, get your popcorn, your chips, your drinks, and be ready because this fight can end at any time.